Our shelter is classified 4 ears Shelter of France with the label "Charme". It is a former(ancient) barn totally reorganized with all the desirable comfort situated on one of the roads of the pilgrimage of Compostelle (Way of Arles). The shelter is accessible to the handicaped persons, the label " Tourism and Handicap " The region is rich in monuments of all kinds: castles, churches, and especially very singular architecture kept(preserved) in the valley, what gives him(her) a quite particular charm. 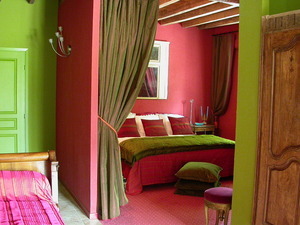 In our guest houses, we shall welcome you in a warm and cosy cocoon. You will be surprised and conquered by our elegant and spacious continuation(suite) and by our bed and breakfast, in the unusual marriage of styles and colors, union of the last centuries. Barbara will make you discover the scents and the virtues of her garden to healing plants whereas Patric will make you share his love of the mountain.